With your Internet connection set up, you’re ready to browse the web from your Mac running OS X El Capitan. 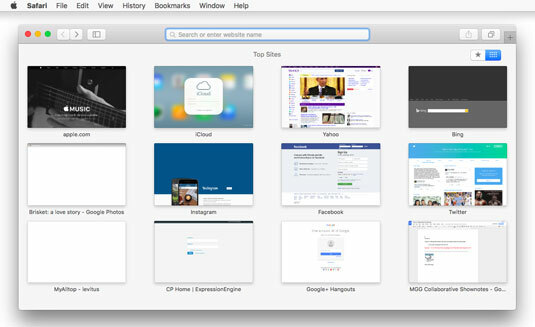 Safari is the web browser installed with OS X El Capitan. If you don’t care for Safari, check out Firefox or Chrome, which are both free browsers and have features you won’t find in Safari. It never hurts to have a spare in case Safari has issues with a particular website. When you first launch Safari, it displays the default Top Sites page, and you’re ready to browse. Safari first displays the Top Sites page.